HALIFAX, Jan. 31, 2019 /CNW/ - One of Nova Scotia's oldest family-run businesses has unveiled a new brand identity to better reflect its evolution and continued growth outside of Nova Scotia. "The brand refresh is a timely reflection of the company's overall growth," says Ian Wilson, President, Wilsons. "While our roots run deep in Nova Scotia, we have experienced significant growth in other markets across the country." This growth has occurred in many areas, including the acquisition of Esso branded gas stations across Atlantic Canada and continued expansion of Wilsons branded retail gas stations and the convenience 'Go Store' brand. Wilsons Heating continues to be a leading residential and commercial fuel and propane supplier in Atlantic Canada. Wilsons Security has also been on a growth trajectory, providing a full range of residential and commercial security solutions across Canada. The company is always looking to offer more value to customers by adding new products and services, such as Wilsons Plumbing Services. 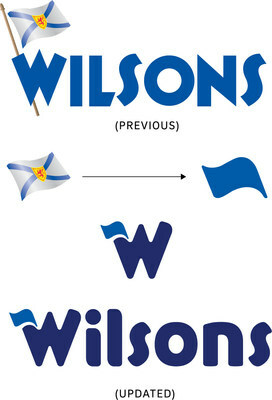 "We're very pleased that the new branding pays tribute to the iconic Nova Scotia flag by incorporating it into the logo," says Wilson. "We used the colour blue from the Nova Scotia provincial flag as a subtle nod to our past, reinforcing our history and pride of place." "While the Nova Scotia flag served us well in helping to differentiate our brand as a truly local Nova Scotian company, we felt that with our continued expansion into other provinces we would be better served with a more versatile logo," says Wilson. "It enables us to have one universal identity that communicates our brand in any market." The branding refresh applies to the Wilsons corporate word-mark and extends across all the Wilsons sub-brands, with design updates for Wilsons Gas Stops, Wilsons Heating, Wilsons Security and Wilsons Plumbing Services. "Great care and attention was exercised to ensure the design was not a dramatic departure from our traditional logo," says Wilson. "We paid close attention to leveraging qualities of the unique typeface to ensure we could carry forward our distinctive identity." Over the course of 2019 Wilsons will be transitioning the new identity across all lines of business, including fleet vehicles and Wilsons Gas Stops. "Wilsons is one of Nova Scotia's most recognizable and trusted brands," says Nelson Angel, President of Haylo, the branding agency retained for this process. "We were very mindful of their existing brand equity, while nudging the Wilsons identity forward with a slightly more progressive and approachable feel." Wilsons traces its history to a mercantile trade company founded in Truro during the early 1800's. Today, Wilsons is the largest independent home heating fuel and gasoline retailer in Atlantic Canada. The retail petroleum subsidiary is Wilsons Gas Stops. It owns and operates 78 company service stations; 13 Wilsons Gas Stops and 65 Esso stations (in partnership with Wilsons' petroleum supplier Imperial Oil). The company also distributes gasoline to over 200 independent retail stations in Nova Scotia, New Brunswick, Prince Edward Island and Newfoundland and Labrador. Wilsons Security launched in 2007. Following a series of business acquisitions and partnerships they are now the largest and most experienced security team in Atlantic Canada serving over 10,000 customer sites across Canada. Wilsons employs over 1,200 people and is a platinum member in "Canada's Best Managed Companies" program.